information with family and friends. For more news, visit www.toyotanewsroom.com. only minivan to make the list. in front, side, rollover and rear crashes based on good ratings in IIHS tests. avoidance feature that significantly reduces crash risk. new car on the road. TMC has redesigned its global corporate website to be more visual and touch-panel friendly. feedback from users overseas and the content is in English. 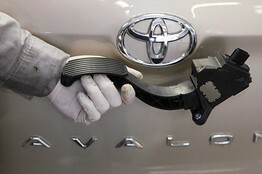 used in the new “Vitz,” scheduled to go on sale in Japan later this month. film to achieve approximately 99% UV-reduction performance.